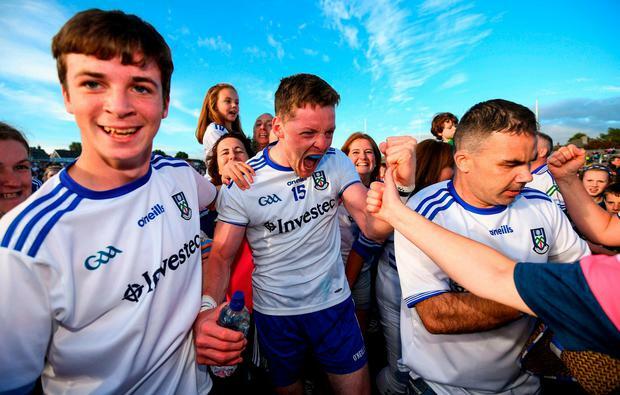 In terms of population Monaghan are the fifth smallest in Ireland but they punched above their weight when it mattered most last night to secure a place in the All-Ireland semi-final for the first time in 30 years. Judging by the noise, there were more Monaghan fans in the attendance of 10,200 than home supporters, and how they celebrated when the referee blew the final whistle. By finishing top of Group 1 after two wins and a draw, they secured a last-four slot against Tyrone or Donegal, who clash in Ballybofey today. They also proved they are not over-dependent on Conor McManus and Rory Beggan for scores. McManus was still the game’s top scorer with 0-5 – four from frees, two of which came after fouls on himself – while Beggan landed a monster 60m free just short of the hour mark to extend his side’s advantage to seven points. However, six other Monaghan players got on the scoreboard, with Ryan McAnespie – not previously noted for his scoring exploits – hitting a magnificent 0-4 from play and inspirational midfielder Darren Hughes kicking two. But it was arguably Karl O’Connell who was the game’s most influential player – he repeatedly turned over Galway and drove forward at every opportunity as the home side produced their worst performance of the season. Galway’s below-par first-half performance – they trailed 0-7 to 0-5 at the break – was similar to their display in the first half of the Connacht final when they also played with the wind. But unlike the Connacht final, they were even worse in the second half, when they were outscored 0-9 to 0-3. It was the worst possible preparation for next Saturday’s All-Ireland semi-final against defending champions Dublin at Croke Park. Finally, at the fifth time of asking, they made it through to the semi-final stage of the All-Ireland series, having lost four quarter-finals since 2012. The late Michael O’Hehir made his first full live broadcast on radio when he commentated on the only previous championship clash between Monaghan and Galway – the 1938 All-Ireland semi-final which the Tribesmen won. It was places in the semi-finals which were at stake as the two sides clashed again 80 years later. 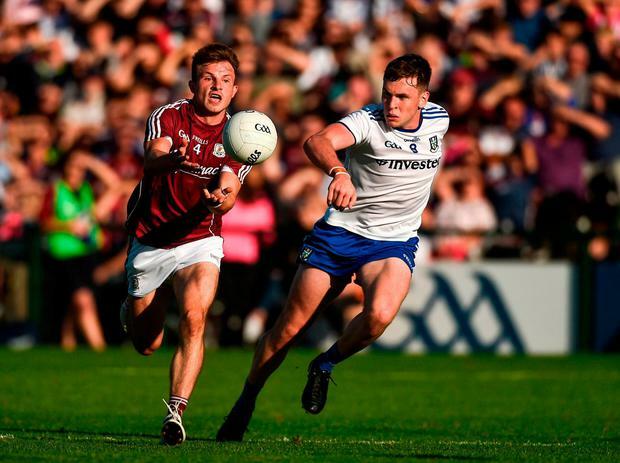 Monaghan’s tactic of pressurising Galway in possession once they crossed the half-way line was paying dividends as they achieved two turnovers early on – one of which ended in a point for the visitors. Galway hit two points on the spin just before half-time through Gary O’Donnell and a Shane Walsh free but it was the only time that they managed to string a couple of scores together. Monaghan’s Drew Wylie was shown a second yellow card and departed the scene near the end of normal time, while Damien Comer and Colin Walsh were also dispatched in injury time after they both picked up a second booking. 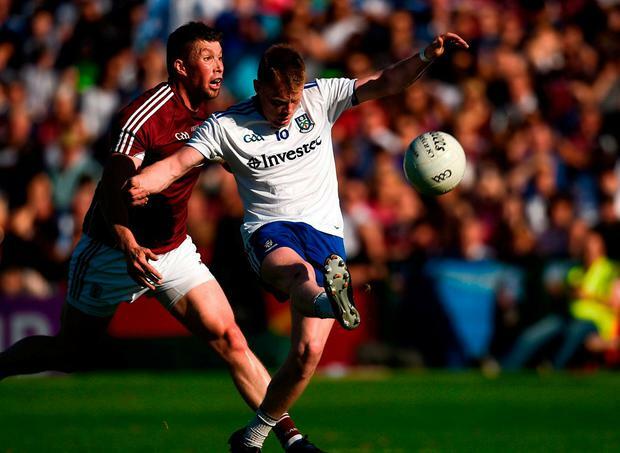 More worryingly for Galway Sean Kelly had to be helped off the field, ensuring both sides finished with 13 men, but McAnespie’s fourth point from play in the third minute of injury time sealed a famous win for the Farney County. Scorers – Monaghan: C McManus 0-5 (4f); R McAnespie 0-4; D Hughes 0-2; R Beggan (1f), C Walsh, V Corey, D Malone, F Kelly 0-1 each. Galway: E Brannigan and S Walsh (2f) 0-2 each; G O’Donnell, P Cooke, I Burke, D Comer 0-1 each. Galway: R Lavelle; D Kyne, SA Ó Ceallaigh, E Kerin; C Sweeney, G Bradshaw; G O’Donnell, P Cooke, T Flynn; E Brannigan, S Walsh, S Kelly; I Burke, D Comer, A Varley. Subs: P Sweeney for Varley (43); C Duggan for Cooke (52); J Heaney for Ó Ceallaigh (56), P Cunningham for Brannigan (61); D Wynne for Kerin (63); Cummins for Burke (66).